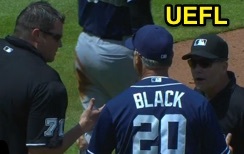 HP Umpire Jordan Baker ejected Padres Manager Bud Black for arguing a fair ball (live ball) call in the bottom of the 7th inning of the Padres-Braves game. With one out and two on, Braves batter Jace Peterson hit a 2-2 slider from Padres pitcher Andrew Cashner on the ground to first baseman Yonder Alonso. Replays indicate the batted ball bounced before appearing to strike the held bat a second time in fair territory while Peterson was still in a legal position within his batter's box, the call was incorrect. * At the time of the ejection, the Braves were leading, 3-1. The Padres ultimately won the contest, 6-4, in 11 innings. This is Jordan Baker (71)'s second ejection of 2015. Jordan Baker now has 2 points in the UEFL Standings (4 Prev + 2 MLB - 4 Incorrect Call = 2). Crew Chief Jerry Meals now has 9 points in Crew Division (9 Previous + 0 Incorrect Call = 9). *Rule 6.05(h) [OBR 2015 Rule 5.09(a)(8)] states, "If the batter is in a legal position in the batter’s box, see Rule 5.04(b)(5) (Rule 6.03), and, in the umpire’s judg- ment, there was no intention to interfere with the course of the ball, a batted ball that strikes the batter or his bat shall be ruled a foul ball." For more information, see Rules 6.05(g) & 6.05(h): Batted Ball Batter's Interference. This is the 83rd ejection of the 2015 MLB Regular Season. This is the 38th Manager ejection of 2015. This is the Padres' 8th ejection of 2015, 1st in the NL West (SD 8; LAD 5; COL 3; ARI, SF 1). This is Bud Black's 4th ejection of 2015, first since June 1 (Dan Iassogna; QOC = Y [Ball/Strikes]). This is Jordan Baker's first ejection since April 17, 2015 (Ubaldo Jimenez; QOC = U [Throwing At]).